The atmosphere at the Ruff Ranch is relaxed and casual. Most people at the ranch are recreational riders who view their horses primarily as companions. Everyone here, shares a love for the beauty and spirit of horses. For anyone participating at the ranch, this pdf package, which includes a Release of Liability and Rules document, must be signed. 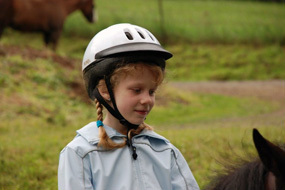 Specializing in both Western and English riding, we offer lessons to all ages starting at age five. All of our lessons are in a safe, controlled environment. We provide you with a lesson horse and each lesson horse is skilled in handling new and inexperienced riders; however, we do have lesson horses for the more mature rider. If you are a horse owner and would like a lesson on your horse, we do have haul-in times available. Private lessons, meaning one horse and rider and the instructor. $25.00 per half-hour (Private horse only). Private horse is a horse belonging to you, leased or owned, that you are using for your riding lessons. Semi-private, means two horses and two riders are receiving instruction simultaneously from one instructor. Surprise your loved one or friend with a "Riding Lesson Gift Certificate". Simply, select one from below, fill in the dollar amount of which package you desire and print. In order to view our Gift Certificates you must have Adobe Reader installed.